If you saw KAKIHARA from Ichi the Killer, aka look-at-profile picture, confirm my existence you sadists. Do you mean in 2008 you were those characters? Or do you mean you WILL be them? I'm typing this and it's Friday and this is the 2009 Memories... ._. Please PM me any pics! Did anyone see me- I was Tohru Honda from Fruits Basket and I actually had red-brown hair instead of brown. Did anyone see the Warden from Superjail? That was me!!! I was running around as Kikyo. I caused a riot in the Karaoke room by requesting Caramelldansen yesterday just before 6. I was up there with five other people xD. I also jumped up with two of my other friends who sang "Every Heart" from Inuyasha in english and when two others sang the pokemon theme song. Did anybody see a loli girl in a pink bodyline dress with cake all over it? I was with a girl in a light blue sailor loli dress for a while. I'm the Sasuke in this video of AB09 Saturday. Did anyone see me? who were wearing a bunch on rainbow things for Japanese fashion-- they'll be going as Marluxia and Vexen again tomorrow, like they did Friday, and I'll once again be the wig-less Deidara (Naruto), and thus will be a brunette Deidara. YES, I believe I saw you! Your outfit is lovely. There were a LOT of Shippuuden Sasuke, but I believe I saw one Team Hawk Sasuke. I do believe it was you. i was only there friday but i was scholar from ffxi ... at least i tried to be haha... people took pictures if you did send send send!! I was L. hehe. One of many. I was wearing pink slippers, ocassionally heart shaped glasses. yes, the Little Mermaid princess with a fork in hand! I was Ken Ichijouji from digimon 02, but my costume was so generic I had to hold up a digivice or a wormmon drawing to be identifiable. Kilt and Chainmail! Failing that a Chef coat reading chef murphy. I know I definately saw link and Roxas...... Did anyone see Tony Tony Chopper? I'm so doing that again next year cause I really didn't get the full effect this year.....oh well! excpect to see yet another chopper next year! oh btw, if anyone remembers taking a picture of me or the one piece crew, could you please send it to me, I didn't get any pics... Thanks! Did anyone see me? I was Zoey from Left 4 Dead with Bill. I had a Fozzy Bear backpack and Bill had a Kermit the Frog pin that said "NO" on it. I had the short brown hair, wacked-up makeup (full body ho ho ho) and huuuggeee black claws. I might have seen you. I was with my Bill and Francis next to the food stands in the main hallway and we kept screaming "Witch" when you(?) walked by. I think it happened twice. Ooooh I saw you, your costume was adorable and as soon as I download my pics I'll send you yours! 'Twas a Phoenix Wright in the bright blue suit, had a gold button for a lawyer's badge. ...A more prominent feature was that I was hangin' with a Sumomo with a GIANT PENCIL. I was with a Haku from Naruto. So, yeah, if anyone saw me or has pictures that'd be great! Rock lee ! I remember the youth dust; it even got to Gaara O_o lol. But no sake bottle like AAC lol. I was Shino and i was with kakashi most of the time. I had no ears in the beginning on Friday, I know a few people took pictures without my ears. Saturday I had my ears and tail. [: Anyone? YOU WERE MOOT! I wanted to get a pic but both times I saw you, you were either on the escalator or too far ahead of me! Waaaa! You should have used the b& hammer on Snacks (or, since there was no Snacks[No food in the center, wwwwwww], did you already do it?)! Seeing these two together made my night. Anybody catch pictures of me as Hibari Kyoya? I had a Hibird pinned to my shoulder Friday(was walking with vaporeon) and Saturday(with Pyramid Head). Or me in my Drocell Cainz cosplay today from Kuroshitsuji? Hi, I was Dawn in the Pokemon Trainer group that consisted of Red, Leaf, Gold and Dawn, and I know that we had like hundreds of pics taken of us, so any and all would be appreciated since we didn't really get any of ourselves!! Thanks! Also known as the floor host from the Hetalia panel? Hey! Anyone see a Miku from An Cafe or a Kaito from Vocaloid? 8D? 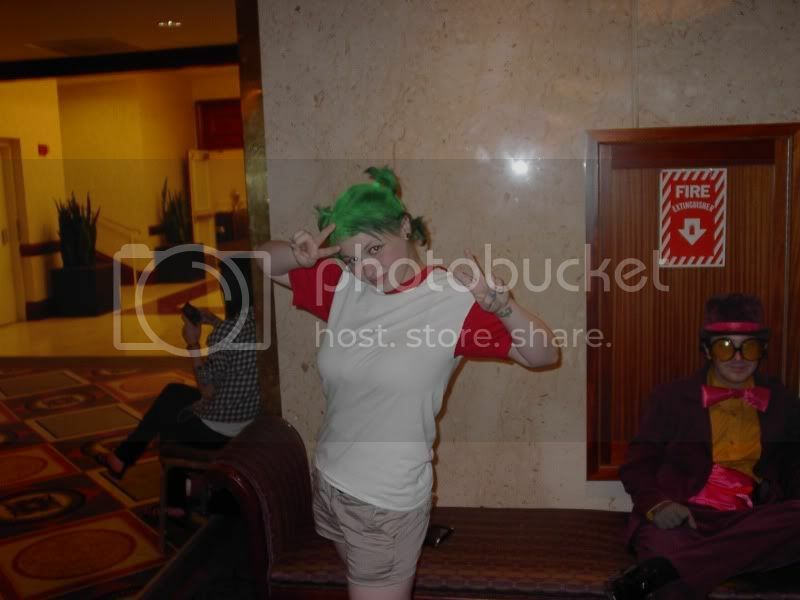 Quote"I was there as Lucy from Elfen Lied. Apparently the "only good one" (I was called that...)"
I was Apollo Justice-era Ema Skye on Friday and Saturday (the one with the atrocious tie and pink purse). I helped semi-organize the impromptu Ace Attorney photoshoot, did anyone get any pictures?